La Strada Was "La Clunker"
We found ourselves downtown for Public Square's Winterfest on Saturday evening, and after the tree lighting and fireworks we started to wander down East 4th in search of food and drinks. Of course The Greenhouse Tavern didn't have any openings for 1.5 hours (do you blame them? I don't! It's fantastic.). So we stumbled into La Strada, owned by Terry Tarantino who also operates La Dolce Vita in Little Italy. I vaguely remember reading a review in The Plain Dealer about how dimly lit the restaurant was- and they were spot on! "R" even commented that they must save a lot of money on their electric bill (what a jokester he is). Once we got over the lighting situation, I started to take in the place. The seating arrangement is a little odd, with the focus being on the classic black and white movies playing through a projector onto the main wall of the restaurant. Is anyone really watching while they eat? It boasts that it is a "Mediterranean bistro", but I really think that it was an excuse to decorate by slapping up random wall decor (ex. tribal mask next to our table) and lots of candles. I certainly did not feel "transported to the streets of Rome, Barcelona, and Athens" as their website claims. Trust me, I've been there. I ordered the Fettuccine Fellini with gorgonzola in a tomato cream sauce ($18). When the dish arrived, I was severely disappointed in the presentation. The noodles were drenched in a pale pink sauce close to the shade of the pasta, and the dish was seriously lacking some garnish. The whole plate just looked bland. The sauce wasn't bad after I made sure that each bite had a substantial amount on it, and the noodles were clearly home-made. A vegetable or something else to add a little color to the plate would have gone a long way in my eyes. Overall, it was just ok. "R" tried the Vagabondo pizza with spinach, tomato, red pepper, red onion, kalamata olive, french feta, and mozzarella ($11). The crust was so thin that it cracked and crumbled as you bit into it, and the pizza was lacking any sauce or a desired amount of cheese. He was pretty disappointed in his selection. While I am glad that we finally tried La Strada, I can't see us going back with so many wonderful options popping up on East 4th. Charity Event That You Must Check Out! "Blog It Forward"- what a concept. Cleveland's infamous Chef's Widow and her hubby Chef Sawyer are opening the doors of their amazing Greenhouse Tavern restaurant for a happy hour event on December 3rd to benefit a wonderful fellow blogger going through a difficult time right now. Read more about the event, and seriously consider attending. We're talking about $6 for Sawyer's highly sought after Chicken Wings- what a deal, and it's all for a great cause! This past weekend we stumbled upon The Old Angle Tavern in Ohio City- and what a find it was! I have passed by there many times, and in my mind I had pictured more of a dive bar. The warm, cozy, rich interior has an artistic flare. Old bookshelves line the mahogany bar- filled with assorted glassware, bottles, books, and tchotchkes. We were instantly impressed with the upscale bar menu and long drink list. We started with the Lamb Sliders- topped with tzatziki & onions ($6). The sliders were thick, juicy, and flavorful. My slider had more sauce on it than the other one, also "R" was a little disappointed with his because of this. I opted for the Ohio City Cheese Steak with grilled onion, assorted cheeses and au-jus ($8.5). The cheese steak sandwich was giant, and the steak was clearly shaved fresh in-house. I will argue that the cheese tasted like American, not "assorted"- but it was still gooey and good. The au-jus is what really brought this sandwich home. "R" had the Grilled Cheese with duck confit, tomato, American & Swiss cheese ($8). It was out of this world. The thick Texas toast supported the hearty portion of cheese and other fillers. The duck confit added just the right amount of richness to the sandwich. All sandwiches are served with fresh-cut french fries, slaw, and amazing thick-cut dill pickles. I am a french fry lover, and rarely want to mess with the flavor by using ketchup- but the Old Angle's house-made ketchup was fantastic. The hint of spices and chunks of tomato complimented the fries perfectly. This is a great happy hour spot, or if you're settling in for a casual evening of drinks and food that is up a notch from other local taverns. It's also a plus that it is only a few miles from our house! You can be assured that we'll be back (soon!). From the time we started dating over two years ago, my boyfriend has expressed his love for Trattoria's House Special Gnocchi Al Burro. In the heart of Little Italy, Trattoria has a lot of great competition on Mayfield Road. Its low profile entrance and signage might not jump out at you, but this is one casual, cozy, third-generation run destination that you should check out. The atmospohere is nothing special, and could actually be called "cliche". However, thier plump, hearty gnocchi make it worth the trip. I have now experienced their gnocchi special more times that I can count, and I too have become a loyal fan. Their homemade potato dumplings are soaked in a tomato, basil, butter and Romano cheese sauce- and it is to die for. 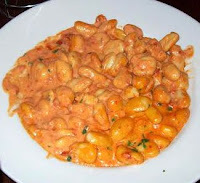 I actually highly recommend getting take out and allowing the gnocchi to absorb the delicious sauce for a while longer. Many things are not as good reheated, but this dish is better! You also need to try their fresh bruschetta that is served with each entree order. The house-made dipping sauce is phenomenal, and the warm baked bread served with it is the perfect spoon! Lucky for us, they sell it by the jar. If you follow me on Twitter, then you know that "R" and I have been frequenting the Tremont Tap House a lot lately. Not only is it located in one of our favorite neighborhoods, but it is just the type of place we envision ourselves owning some day (and I do mean some day). The exposed brick, funky decor, warm lighting, casual atmosphere, and outstanding food often fits what we are in the mood for. I've been nothing but impressed with the food we've had there: gourmet burgers, home made pizzas, seafood entrees, hanger steak, and ahhh the Hot Pretzel with Imperial Stout and Smoked Cheddar dip ($6). Of course I can't forget to mention their extensive beer list! They have a nice happy hour, with several food specials including the house burger for $5. However, we stopped in for their famous brunch last Sunday and what a disaster it was! For once, I will not be writing about the food- because it was that terrible. My Steak and Eggs was missing the red onion relish, the steak was well done, and the eggs were severely under cooked. I will be writing about their service and how well they responded to an unfortunate situation. Brunch begins at 10 AM on Sundays, and we arrived around 10:10. There was one other table seated. Our waitress quickly informed us that the chef had not arrived yet, and everything that included a hollandaise sauce was not available (which is nearly half the menu). We didn't mind, and placed an order for two items sans sauce. As the bar and dining area began to fill up, we realized that the chef was still not there. Over an hour later, our food had still not arrived and the staff was scrambling to handle the situation. Both owners were present, and stopped by our table several times to apologize. The food finally arrived- prepared by a sous chef in over his head but he served us with a smile and great attitude. It was pretty bad. As we finished our meal, one of the owners- Christopher Lieb -stopped by one last time. He apologized profusely and gave us his business card. "Next time you want to come in, just give me a call and we'll get you a gift certificate, " he said. Apparently his partner had run to grab some, but would not be back before we left. We were thrilled with the offer and thought that it was very appropriate. Then came the surprise. We received the bill and they had taken $15 off the $34 bill- almost half! Things happen. Anyone who has worked in the restaurant industry understands this more than most people. It is all about how you handle the situation, and the owners and staff at the Tap House handled it better than I've ever experienced before. I will not hold this disastrous brunch against them, and you can believe that we'll be back there soon! I have been to Prosperity Social Club in Tremont twice now, and I've been pretty impressed with the place. My first visit was not too long ago, for happy hour with co-workers and friends on a Friday evening. We enjoyed discounted drinks, decent food, and board games galore! One of the best things PSC has to offer is their collection of board games available for patrons to use while they dine and drink. As our group dwindled from 9 to 5 people, we started to play Candy Land and Chutes and Ladders- as drinking games (very fun, and I can explain the "rules" if you are interested). Overall, we had a great evening but I did think that my pita bread which accompanied the spinach and artichoke dip ($8) was over baked. Last night was my second time dining at PSC, and the food experience was much better than the first. We arrived early to take advantage of their great Happy Hour deals from 4-7PM. Domestic bottles were $2 and micro brew drafts were $3.75. They also have great wine and cocktail deals. During happy hour, several appetizers are on special, including a dozen mussels ($3) and the hummus plate ($5). We started with the mussels, which are sauteed in a garlic butter white wine broth and served with warm bread. The broth was delicious, though heavy on the garlic so consider yourself warned! The toasty warm bread was the perfect avenue for soaking up the broth. The hummus is made in-house. It was unique and we really enjoyed it, but I did think that it lacked some acidity. The plate came with toasted pita bread (not as bad as my first experience, but still overly crisp), tomatoes and cucumber slices. It was a large bowl of hummus for the $5 price. They have week night specials, and Tuesday is $5 Cheeseburgers day. The patty was cooked nicely (medium as requested) and the bun was very fresh. It was a little messy to eat, but delicious. The house fries that come with the burger were fresh cut. It was a great deal for $5! I've also heard that they have excellent fall-off-the-bone ribs and that the Friday Fish Fry is very good. It is a great casual bar with tasty food, so if you're looking for a relatively cheap night out and some good old fashioned fun with board games you should check this place out. Anyone who pays attention to the restaurant scene in Cleveland has heard of Zach Bruell and his popular contemporary cusine at Parallax (Tremont), Table 45 (located inside the InterContinental Hotel by the Cleveland Clinic), and his newest restaurant L'Albatros Brasserie & Bar (University Circle). I've had the pleasure of dining at Parallax before (delicious modern seafood), haven't made it to Table 45 yet, and last night was my first time experiencing L'Albatros since its opening. I have to say that if my decision was based on the decor and atmosphere, I would not be going back. Bruell's contemporary trend was taken a bit too far with the cold white plastic chairs and table, minimalist artwork and decor, and simplistic (a.k.a. boring) bar area. Also a glass of wine runs you about $10. Now on to the food- which is where he really shines! We started with the "French Toast" served with ragout of wild mushrooms and balsamic syrup ($8). Our waitress stated that it was their signature starter and very popular. The dish was very rich, but inventive and flavorful. The carmelized mushrooms and hint of balsamic syrup was a wonderful combination. The light, fluffy french toast squares just melted in your mouth. Two of us ordered the pasta special of the evening which included house-made noodles smothered in a light goat cheese fondue with grilled cauliflower. The dish was tasty and the portion was perfect, but I think I would have enjoyed my first choice off their regular menu a little better. I think it was the words "goat cheese fondue" that got me! Luckily, our other dining companion ordered my top choice: Seared Sea Scallops with brussel sprouts, noodles and pernod cream ($20). The gigantic scallops appeared to be seared to perfection, and they were nestled on a bed of house-made noodles. I may be back to try this dish for myself! We finished with the Warm Chocolate Brownie served with crème anglaise and vanilla bean ice cream ($7). It arrived warm as promised, and the ice cream was melting right into the thick gooey brownie. Umm, can you say heaven?! Overall, I was impressed with the food and will probably overlook the atmosphere of the restaurant while dining there again. Rumor has it that Bruell is opening a fourth restaurant on East 4th in the near future. Keep your eyes peeled! It was a weekend of dining out in our household, but unfortunately Luxe Kitchen & Lounge left such a sour taste in my mouth on Friday night that I won't even bother with a blog post just for them. Marlin Kaplan and his team did not deliver on Friday night (aside from the Harissa Dusted Chicken Wings with Yogurt Honey Sauce), and I have sworn off pork cheeks for the rest of my life. Three Birds in Lakewood was the real highlight of our "Fall Fun" weekend, as we called it. We have both been dying to go there but just hadn't made it there yet. I've heard nothing but rave reviews about what James Bell and executive chef Rachel Speith are doing with the restaurant, and I couldn't wait to check it out for myself. We arrived around 8:30 p.m. and the place was packed. The wait was short, but the bar and dining room were both hopping. I was immediately struck by the atmosphere: warm, cozy, modern without being cold, and the restaurant has a casual feel with a touch of class. We settled into our table (unfortunately tucked away in a small room off of the main dining room) and ordered drinks. The waiter was knowledgeable and funny, and we instantly liked him. We started with the Shrimp Bisque (on special) and the Poached Pear Salad. The bisque was creamy and complete with small chunks of tasty shrimp. The salad was refreshing, but with arugula as the base it was a little hard to get it on your fork. Originally I ordered the pork tenderloin entree, but sadly they were out of the dish and I moved on to my second choice: Beef Tenderloin with Yukon Gold Mashed Potatoes and Root Vegetables ($29). "R" ordered the Maine Lobster Pizza with Manchego Cheese, Caramelized Cipollini Onions, Roasted Garlic Puree, and Fresh Herbs ($15) from the appetizer menu. Our soup and salad had arrived quickly, but our entrees seemed to be taking a while. We had just started to notice this when the manager appeared at our table to apologize and offer free desserts. We didn't mind waiting, and were really enjoying the evening over a glass of wine, but it certainly was nice to know they cared that it was taking longer than it should. Let me tell you- it was worth the wait! The filet fell into the category of top three steaks in my life, and the pillow of mashed potatoes was creamy and satisfying. My only criticism is of the sauce that accompanied the root vegetables. It was overpowering and tart, and I quickly pushed them aside. This rarely ever happens, but "R" was happy to steal them away. His pizza was tasty and topped with quite a lot of lobster meat. The manchego cheese was a nice discovery. We were absolutely stuffed by the time we had finished our entrees, but we gladly accepted their offer of a free dessert and took home an order of the Goat Cheese Cheesecake- the wait staff's favorite. Three Birds exceeded my expectations, and they were pretty high to begin with. We will certainly be back! Possibly to check out their beautiful brick-enclosed patio during the warmer months. "We'll Have One of Everything, Please"
The title of this post is how I felt at Flying Fig in Ohio City on Saturday night. My parents were in town for the weekend, and "R" and I took them out for a nice meal. We were in the mood to share and sample, so Fig's "savory smalls" and "savory starts" was exactly what we were looking for. The small bistro is warm and inviting, a cozy setting nestled on Market Avenue across from Great Lakes Brewing Company. The trees outside glitter with twinkling lights, and you are instantly warm and relaxed inside the restaurant. We started with the house soups of the day, Pumpkin Bisque and Hot Banana Pepper Bisque and a Local Greens salad ($8- Soft Herbs, Croutons, Sherry-Garlic Vinaigrette and Manchego Cheese). Both soups were fantastic, but the pumpkin bisque was the perfect end to a beautful fall day in Cleveland. It warmed you to the core and left us excited about the season. We also shared thier famous Tempura Battered Green Beans ($7- Ponzu Sauce and Pineapple Caramel), which were fabulous. The lightly battered green beans came with soy sauce and a delicious sweet and sour dipping sauce. Then we literally told the waiter to bring us "one of everything" off of the Savory Smalls menu section. This was inspired by their menu option of combining selections for a Trio of Small Plates (Choose 3 items) for $24.50. The items included: Herbed Ricotta Gnocchi (With Braised Plum Creek Farm Rabbit, Caramelized Onions, Wild Mushrooms and Romano Cheese), Seared Scallop (Stuffed with Braised Beef, Horseradish Potato Puree), Morrocan Spiced Crispy Tofu (Lentils & Rice, Harrissa Yogurt and Preserved Lemon), Medjool Dates (Stuffed with Chorizo and Wrapped with Smoked Bacon and Smoked Pepper Sauce), Stuffed Banana Pepper (Housemade Italian Sausage and Tomato Thyme Coulis), and finally a Crispy Polenta Cake (Tomato and Fennel Sauce with Mascarpone). The real highlight were the stuffed dates. The chorizo and bacon added a smokey flavor to the sweet date, and we were fighting over the last bite. The scallop was seared to perfection, and the gnocchi was hearty and flavorful. The only dish that was not a huge hit at our table was the tofu dish. It was a little dry and under seasoned. Overall, we were extremely happy with the meal and the service was very good. Several of the entrees sounded creative and appealing, so we will certainly be going back for seconds! Recently, we found our way over to Lucky's Cafe in Tremont for their famous brunch. Owner/chef Heather Haviland is making quite a name for herself in Cleveland, and people are raving about her desserts and brunch. Their delicious brunch is served from 9 AM - 3 PM on Saturdays and Sundays only, and they are quite popular! During the warm weather months, you can sit outside at brightly painted picnic tables. Selecting a menu item was difficult, as many were very tempting, but I settled on the Breakfast Burritos: veggie scrambled eggs rolled in flour tortillas, covered with a guajillo pepper sauce & cheddar cheese, baked in a casserole and served with hash browns. The dish was piping hot and smelled amazing as our server set it down in front of me! The pepper sauce had a nice level of heat behind it, but was not overwhelming for first thing in the morning. "R" had the Biscuits: cheddar scallion biscuits topped with soft scrambled eggs and sausage gravy and served with hash brown potatoes and grapes. The biscuits were freshly baked and melted in your mouth. The combination of eggs and gravy was hearty and tasty. The gravy was nicely seasoned, with just a little kick to it. We decided to split a side of the Pecan Bacon, and I am so glad that we did! The thick-cut bacon was lightly breaded with crushed pecans, and was perfectly sweet and savory. Also, Lucky's coffee is fresh brewed and served in gigantic coffee mugs that leave you smiling. This restaurant is quite a gem, and although it was a little pricey we will definitely be going back! Catch Heather and Lucky's Cafe on the Food Network's Diners, Drive-ins, and Dives on October 12th! The first time I went to Fat Cats in Tremont was almost two years ago, and at the time I had stated that I wanted to come back and bring my foodie boyfriend. 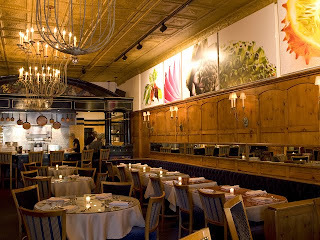 Well it is so darn tucked away on West 10th Street, that I forget about it when selecting a Tremont restaurant. Luckily, it sprung into my head on Friday evening when we were trying to decide where to go to dinner. This funky, trendy, laid-back restaurant is not only known for its good food but its amazing view of the city. We had the pleasure of dining during the Friday fireworks show at the Cleveland Indians' game, which was outstanding! The restaurant has a perfect view (with a few branches in the way) of Progressive Field and the city skyline. They also have a nice little (and I do mean little) patio outside for warm weather dining. Now on to the delicious food...we started with a spicy shrimp appetizer served with mango salsa that was a special that evening. The rub was a little dry, but overall we were happy. The juicy mango helped balance the dish. "R" had the Hanger Steak with pommes frites, spring greens, house Worcestershire sauce, and added bleu cheese sauce. The steak was cooked medium rare, and it was simply perfection. The bleu cheese sauce was not overpowering and added a little something special to the steak. I had the penne special with sweet sausage, mushrooms and green beans in a spicy marinara sauce. I was torn between this dish and the scallops entree, but the waitress recommended the penne. She was right! The sausage was sweet with just a little kick to it. The sauce was delicious and left me wanting more. As if we weren't full enough, we ended with the cheese plate appetizer for dessert. The two of us can never turn down a good cheese platter. It consisted of three goat cheeses (all soft), walnuts, and pickled grapes. I think the assortment would have been better with at least one hard cheese selection, but overall I enjoyed all three options. The unusual piece of the dish were the pickled grapes. It sounds so odd, but they were strangely good. If you are looking for a laid-back, comfortable dining experience with excellent food and an amazing view, I highly recommend Fat Cats. This is one little restaurant that I will no longer overlook! It left us smiling and feeling like happy "fat cats". It is unusual for me, but I have had Mexican fare twice in two weeks. It's not that I don't like Mexican food, but it has always been one of the cuisines that I need to be in the mood for. We had a gift certificate to Zocalo's Mexican Grill and Tequilera, so we decided to use it last week before it expired. I have been there before (three times actually) and the food has been so-so, but this time it was so terrible that I will not go back. I know that they brought in celebrity chef Aarón Sanchez to recreate their menu when the restaurant started to flop after its opening, but it has not improved and I swear that they keep changing how their items are prepared. We tried to start with the Calamares Fritos appetizer, but they had sold out. A little disheartened, we opted for the Empanadas de Carnitas- three crispy empanadas filled with slow roasted pork and marinated onions served with a tomatillo avocado salsa and pickled onions. The empanadas looked and tasted as though they came from Sam's Club in frozen bulk. They were flavorless and chalky, and we didn't even fight over the third empanada. I always like to order combination plates when at Mexican restaurants. I like to try a couple of smaller items and have variety on my plate. I have ordered their enchiladas before, and I have never seen what came out on my plate. The enchilada was covered in what tasted like a marinara sauce- not what I wanted with my Mexican. It too was bland and ruined the enchilada for me. The only highlight was the burrito. It was very good, not the best, but very good. The ingredients were fresh, and the blend was tasty. My companion ordered the Tacos de Pescado (fish tacos), and was very disappointed. The mahi-mahi was overcooked and dry, and the tacos were soupy. The highlight of your meal at an "authentic" Mexican restaurant should not be the rice and beans, but unfortunately the side dishes were the best part of our meal. On a lighter note, we dined at Cozumel in Independence last night and it was to die for! They have great food, good prices, and you almost feel as though you are really dining in Mexico. The staff is always warm and friendly, and the margaritas go down a little too smoothly. Once again, I ordered a combination platter with a beef burrito, cheese enchilada, and a chili relleno. All three were flavorful and authentic. My love for Mexican fare has been restored! Since its opening this spring, I've been meaning to get over to East 4th and try Jonathon Sawyer's The Greenhouse Tavern. As the first green-certified restaurant in OH, it has created quite a buzz in the restaurant world. I'd enjoyed his dishes at Bar Cento in the past, so I was really looking forward to trying out his new restaurant. I had stopped in for a peek a few weeks ago when I was in the area, and was impressed with the decor and atmosphere. The "green" elements are everywhere. The food lived up to my expectations. I opted for the Pommes Frites with two poached eggs & black pepper. The fresh-cut fries were cooked perfectly, and the black pepper seasoning was just right. They had just the right amount of kick! The real highlight of the dish were the two poached eggs perched on top of the pile of fries. I broke the yoke and spread it over the fries, and thoroughly enjoyed the warm gooey goodness. My dining companion ordered the Vegetarian Entree special, which that evening was a risotto. Her dish was flavorful and the plating was very artistic. The only complaint (ok two) that I have are that the chairs on the patio are very uncomfortable and the drinks are a little overpriced. I went with the House White (a dry white) that was $6, but my friend's wine selection was $10 a glass. The price of drinks and uncomfortable chairs kept us from settling in, but maybe that is the goal. The place was packed and the turn over was quick. This has definitely become one of Cleveland's hot spots overnight. I want to give some credit to their PR person (or persons). Whoever you are, you've done an amazing job. Congrats to Sawyer and the Greenhouse team- you delivered! By the way- they are now open for lunch! I would never have thought to dine at Sans Souci located in the Renaissance Cleveland Hotel on Public Square, but I had received a gift certificate at the holidays and I figured that it was time to use it on Saturday. First, I have to say that it was incredibly hard to find in the hotel. I have never been in the Renaissance, but when we entered at street level we were not on the main lobby floor which was odd. Once we reached the lobby level, there was a serious lack of signage and I had to actually ask the front desk where the restaurant was. This may be fine for out-of-town travelers, but if you are trying to drive local Cleveland traffic to your restaurant then I found it a little discouraging. Now the restaurant boasts "accents and murals of the sun drenched Provincial countryside". My dinner date commented that you felt like you were in an upscale Olive Garden. I agree. The decor was odd and a bit tacky, but I wasn't focused on that since our table (one of the only four) had an amazing view of Public Square through large glass windows. I did notice as we left that our small section of tables were the only tables in the place with that view. Their restaurant is broken into several small areas, which creates a cozy atmosphere, but interrupts the flow of the room. Ok enough complaints, now on the food- the highlight! I wasn't sure what to expect, but the food blew any expectations that I had out of the water. We were in no hurry for dinner, so we took our time and ordered several different courses. We started with the Chef’s Garden Squash Blossoms with Jonah Crab Squash Blossom stuffed with Sweet Crab, Marscapone and Lemon, Sun Gold Tomato and Basil Oil Garnish. The dish was so creative and the presentation was artful! The crab was slightly overwhelming, therefore the other flavors were hard to taste, but overall the dish was very good. A+ for innovation. Then we sampled the Wood Grilled Mussels in a Cilantro & Tomato Fondue. The mussels were some of the best that I've had, which says a lot since I am obsessed with Southside's mussels in Tremont. The broth base was earthy, and the smokey flavor really enhanced the mussels. For my entree, I opted to try one of the "Signature Items"- Angel Hair Pasta with Lobster Cream, Fresh Basil and Pasta. The portion was perfect. Many pasta dishes completely overdo it, but this was just right. The presentation was interesting as well. 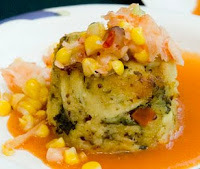 The pasta was twisted into a long roll, with the sauce and fresh lobster meat poured on top. The sauce was spiced well, although a little runny, but the real highlight was the abundance of fresh lobster chunks. The plate was filled with succulent meat! My dining companion ordered the Veal Osso Bucco with Saffron Risotto, Sautéed Spinach , Braising Jus Reduction. The waitress stated that it "fell off the bone", and she was spot on. As soon as he touched the bone with the tip of his fork, it slid right away from the meat. The veal was cooked perfectly, but the sauce was a little heavy. It overwhelmed the saffron risotto, so it completely lost its flavor. We ended by splitting a flourless chocolate cake, which was decent but not worth writing any more about. Overall, I was pleasantly surprised with our dinner and commend the chef for her creativity and presentation. Bar Cento in Ohio City celebrated serving its 50,000 pizza last night by offering a FREE pizza for any purchase of a carafe of beer or wine. What a fantastic deal! Three of us headed over there after work, and I'm so glad that we did. We started off with two carafes of Stella Artois and Blue Moon, and the Arugula Pizza w/ pine nuts, onion, garlic & mozzarella and the Salsiccia Pizza w/ tomato sauce, provolone & sweet Italian sausage. The beers are two of my favorites, and both of the pizzas were very good (both thin crust). The arugula pizza had just the right amount of spice, and the caramelized onions were a nice touch. The salsiccia pizza was a little salty, but overall very interesting and tasty. We finished the evening with another carafe of stella and the Sunnyside Pizza w/ eggs, provolone, pancetta & lots of black pepper, which our waiter boasted was the most popular pizza on the menu. It was certainly creative with its over-medium egg and strips of bacon. I would order it again. The pizzas run from $6-$13, so to get three pizzas for free was one hell of a deal. Congratulations to Bar Cento for serving over 50,000 pizzas, and now I can see why after sampling three delicious versions! 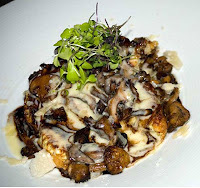 This past Friday we dined at Melange in Beachwood for the first time. They had participated in a food/wine event that I attended this spring, so I was anxious to try their menu. It was a gorgeous evening, so we requested patio seating. The patio is small- seven tables and a full bar, but hey it's patio seating and this time of year I'll take anything that allows me to dine outside. We decided to just get a couple of appetizers and share so that we could sample several dishes. I'll be honest- the entrees just didn't sound as good as many of the hot and cold starters. We started with the Farmers Market Tomato Salad (local sourced tomatoes, fresh mozzarella, kalamata olives, basil, olive oil, aged balsamic). The fresh mozzarella was firm and creamy, but the tomatoes were a little mushy. Overall, the dish was ok but it was probably my least favorite of the evening. We then moved on to two hot starters: Lobster & Lump Crab Cake (local sweet corn and black bean salsa) and the Goat Cheese Fondue (Lake Erie Creamery Goat Cheese, Seasonal Fresh Fruit, Toasted Bread Assortment). The crab cake was good and full of large chucks of lobster and crab meat, but I've had better. Now the fondue was the shining star of this meal. The thick, creamy goat cheese was so tasty and rich that I fully admit I was scraping the bowl. The only complaint that I have about this dish is that they only serve enough bread and fruit for about half of the fondue. We had to order extra bread just to finish the dish. There was no way that I was leaving half of that cheese behind! Finally, we ended the meal by splitting a Cheese Plate (on the cold starters menu) and The "Candy Bar" dessert (pretzel, peanut butter chocolate mousse, caramel, salted peanuts, chocolate covered pretzels). The cheese plate had a nice assortment of artisan cheeses and fruit. The interested aspect of this dish was the sesame seed spread, which our waitress informed us that most people won't even try this. It certainly looked a little odd, but it was a nice addition to the cheese in moderation. I was not blown away by Melange, but I would dine there again. The atmosphere inside is quite different than the patio. The plush booths and funky lighting was very upscale but almost stuffy. I fully admit that I do not have a ton of Vietnamese dining experience under my belt, but I have to believe that #1 Pho on Superior Avenue is one of the best in Cleveland. My opinion is not only based on personal experience, I have read several reviews that rave about this little hot spot as well. It is tucked away on the corner of Superior and East 31st, and you almost feel as though you are walking into a different world when you enter. The atmosphere is great- light and airy with an Asian twist that does not at all feel "chintzy". The menu is reasonably priced (approx. $10 for lunch) and delicious! I have yet to venture away from my lemongrass shrimp vermicelli with crispy spring roll, but have had the pleasure of sampling dining mates' dishes and everything has been very fresh and flavorful. The sweet and sour sauce is light and tangy, with a hint of orange. If you're in that area for lunch, I highly recommend stopping in. The Cleveland Botanical Gardens launches the first "Gourmets in the Garden" event this evening. For $5, experience cooking demonstrations from some of the best chefs in Cleveland's finest restaurants while you enjoy the beauty of the gardens. All demonstrations begin at 6 PM on Wednesdays from June 10-September 2. This series has become so popular that you have to make reservations, so don't wait! Call 216-721-1600, ext. 100 for reservations. Tonight, Spice of Life Catering will be preparing a specialty dish. They are one of my favorites. I can't make it tonight, but you should! For a complete list of restaurants featured, click here. The Gardens is also offering "Cocktails in the Garden" this year. The good news- it's the same night at Gourmets in the Garden! What goes better with delicious food samples than a glass of wine or fun cocktail?! Click on the link above for a list of featured cocktails. The Cleveland Independents' new site has launched, and in my personal opinion looks great! I am a big supporter of the Independents, and whole-heartily believe that we (Cleveland diners) should support our local independent chefs and restaurateurs. Not that chain restaurants don't serve a purpose, and I'm a big fan of some, but in this economy we should do everything that we can to support our community businesses. It helps that the best restaurants in Cleveland fall into this category! Take a look at their list of restaurant members. You have over 80 to choose from. Also check out the newly designed Event Calendar, which makes searching for special events even easier. 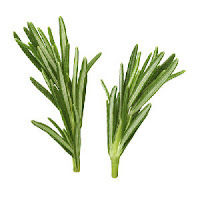 Hummos: Puree of chickpeas, tahini, and lemon topped with fresh herbs and extra virgin olive oil. Tabouli: A delicate mixture of parsley, onions, cracked wheat and tomatoes seasoned with extra virgin olive oil, lemon and herbs. Baba: Puree of charbroiled eggplant, tahini, garlic, and lemon topped with fresh herbs and extra virgin olive oil. Falaffel: Mildly spiced vegetarian patties made with chick peas, fava beans, parsley, and scallions. Fried in peanut oil and served with Tahini Yogurt sauce. Dawali: Grape leaves stuffed with rice, chick peas, tomato, and parsley, topped with Aladdin's dressing, feta cheese and parsley. Their hummos is excellent and very smooth, with just the right amount of lemon. My other favorite is the grape leaves, or "dawali". The small rolls are fresh and filling, and the Aladdin's dressing is one of the best dressings that I've had on grape leaves. There are several locations, so click here to find one near you! I've been looking forward to trying Pier W in Lakewood for some time now, and I have to admit that I am a little disappointed after our dining experience on Sunday night. While there is no contest that the restaurant has the best view in Cleveland (picture beautiful cliffs above Lake Erie and the downtown skyline twinkling in the distance), the food was kind of a let down. We started with the BRAISED ANGUS BEEF SHORT RIB PIEROGIES served with Caramelized Cippolini Onion Jus. The angus beef was rich and savory and the pierogies' dough was heavenly, but the caramelized onion jus was overpowering and ruined the dish for me. We also sampled the HEARTH ROASTED BLUE HILL BAY MUSSELS with a Rustic Tomato and White Wine Broth. The broth was flavorful but the mussels didn't seem to absorb the broth as much as I would have liked. I almost didn't know that the dish was as good as it was until I took a spoonful of the broth. For my entree, I tried the FRESH LOBSTER PAPPARDELE (Chunks of Fresh Maine Lobster, Fresh Pappardele, Roasted Red Peppers, Haricot Verts, Light Cognac Cream Sauce), which was a little rich and heavy. The "chunks" of lobster were minuscule, but the haricot verts were a nice addition and added a slightly crunchy texture to the dish. Overall, it wasn't bad but I think that I would have been happier with the diver scallops or halibut dishes that I was eyeing up. One of my dining mates ordered the BASIL SEARED #1 HAWIIAN BIG EYE TUNA, served raw with a Potato and Leek Tart, Tomato Jam, Sweet Onion Coulis and Basil Oil. The fish was very fresh and tender. The basil leaves on top of the fish gave it a slight basil flavor, which was very light and complimented the tuna. The sweet onion coulis was flavorless and did not add anything to the dish. It should have remained in the kitchen. We finished with a Lake Erie goat cheese plate, Riesling Poached Granny Smith Apples with homemade cinnamon ice cream, and a Godiva White Chocolate cheesecake. The Poached Apples were unique and creative, but the cheesecake was only so-so. My favorite dessert was the cheese plate. The cheese boasted a "bloomy rind" that was soft and edible. Spread on a toasted piece of raisin nut bread and fruit jam, it was delicious! Last of the "World Class Wine Series"
Head over to Lago Restaurant & Wine Bar on Professor Avenue in Tremont for the last "World Class Wine Series" event of the season. Each tasting includes 25 elegant wines and light hors d'oeuvres. $40 per person plus tax, reservations required. 8:30 PM this Friday night, featuring wines from Tuscany and food pairings to compliment the region's wine. This is one foodie who will definitely be there! Last night my co-workers and I went to Mi Pueblo in University Circle. The real draw was 1/2 price margaritas- any size! You can't beat $10 for a pitcher of margaritas on the first "summery" day in Cleveland. It was a little disappointing that this restaurant doesn't have outdoor seating, but we decided that flavored margaritas and cheap Mexican was worth the sacrifice. Parking was great, they have a little lot behind the restaurant off of Euclid. Many of the shops/restaurants in that area do not. We settled into a booth with a good view for people watching. This is where is starts to head south...It took the waitress about 15 minutes to take our drink order, and half an hour later we still didn't have menus. Once our waitress resurfaced, she realized that we didn't have menus and took our order quickly. As with most Mexican food, it came out shortly after, but at this point we had been waiting for almost an hour. At least we had tortilla chips, two types of fresh homemade salsa, and pickled carrots to keep our tummies from rumbling too loudly. The salsa was a highlight of the meal. It was very fresh and just the right amount of "kick". One unique thing about Mi Pueblo is that each dinner is served with a cup of chicken soup. Bizarre concept, but tasty nonetheless. I ordered the Enchilada Rojo Combinacion, which included two cheese or chicken enchiladas with red sauce, two small cheese quesadillas, refried beans, rice, salad and guacamole. The enchiladas were savory, but I did need to add a little hot sauce to satisfy my love for spice. The tortillas on the quesadillas were a little grainy and tough, so I left one on the plate. I am a huge guacamole fan, and this was pretty good. You could actually see the fresh cilantro leaves and it was chunky, which I love. I just could have used a little more. All in all, it was an adequate meal with tasty, and CHEAP, margaritas. While there are many other BETTER Mexican restaurants in Cleveland, I do recommend their half-price Wednesday special on margaritas if you are in the area. Just don't go out of your way, and don't carry high expectations. I had been craving, and asking for, sushi for several months now, but we just hadn't made it to any of our local favorites. Traveling home last night from NY, we found ourselves on the East side. We headed to one of our favorite Thai places, Ly's, but quickly remembered reading that it had closed. Scrambling for ideas, we headed back out on the road. Since I really had a craving for sushi, we decided to try Pacific East and I can not express how happy I am that we made that decision. The restaurant itself was a lot smaller than I expected, with only about a dozen tables and seating at the sushi bar. I realized very quickly that they have a loyal following in the area as several patrons greeted the sushi chef by name and he commented on personal details of their lives. This is always a good sign! We started with the Black Pepper Tuna appetizer- black pepper coated tuna seared then thinly sliced, served with cucumber, scallion & the special honey mustard wasabi sauce. The tuna was finely coated, pan seared and served raw with a delicious sauce lightly drizzled on top. It was tasty, but not the highlight of the meal. I've had better. I am not terribly adventuresome with sushi. I tend to stick with my favorites, and willingly try anything that my table mates order as long as it doesn't include eel (childhood story that still gives me nightmares). I ordered a California roll and a Spicy Crunchy Shrimp roll. Both were excellent and you could taste the freshness of the ingredients. The spicy sauce was one of the best that I've had- one of the plus sides of always ordering the same thing! "R" ordered a Manhattan roll, which was outstanding. The large roll was stuffed with shrimp tempura, vegetables and spicy sauce, and then topped with fresh avocado and a creamy lobster sauce. The lobster sauce was savory and included medium-sized chunks of fresh lobster meat. The sauce really brought the dish all together, and it was one of the best rolls that I've ever had. This is one Japanese restaurant worth checking out! This little Japanese restaurant is tucked away in the bottom of an office building on Public Square, and unless you work in that area you would never know that it is there. Luckily, a friend who works downtown took me there this week. I took her advice and ordered the "Little Something" (I think! ), which included a small salad with a delicious traditional Japanese dressing, a battered chicken satay drizzled with a sweet and tangy sauce, sticky rice with sesame seeds and a signature soy sauce, and a crispy chicken spring roll. For $5, it was a feast! Beware that it is cash only, but check out this little gem if you are downtown at lunchtime. After trying to hit up Luxe with a friend from out of town on Saturday night and being told that the wait was 1.5 hours, we ended up at Fahrenheit. I have had the pleasure of eating there twice before, but both were for closed parties with a special menu for the event. So this was the first time that we had ordered off of the regular menu, and what a treat it was! I had been meaning to for quite a while now, so even though it was our second choice I was very excited. To start, we split the "Fahrenheit Spinach and Artichoke Dip- Artichokes, Lemon, Parmesan, Tabasco, Toasted Chips and Pita". The pita bread was warm, soft and fresh, and the dip was tasty with large chunks of artichoke hearts and spinach in a gooey delicious loveliness. I then had the "Coffee & Mustard Crusted "Heritage” Pork Tenderloin, Maple Sweet Potato, Toasted Nuts". The pork was lean and lightly crusted. The waiter recommended it be served medium, and he was right. The meat was juicy with a slightly pink center. The tenderloin was served on a bed of maple sweet potato mash (delish!) and a small serving of fresh spinach. My table mates ordered the "Wild Mushrooms, Local Goat Cheese, Caramelized Onions, Rosemary pizza" (which was fantastic, but even better later that night after hitting up the bars downtown), "Pan Seared Sea Scallops, Potato-Wild Mushroom-Edamame Corn Hash and Truffle Buerre Blanc" (scallops were cooked perfectly and the light sauce was very flavorful), and "14oz Strip Steak, Balsamic Roasted Shallots, Blue Cheese Herb Butter, Crispy Onion Straws". Rocco's "comfort classics" as he calls his menu is just that. He takes basic dishes and adds a special flare that puts it over the edge. His dishes are artistic, flavorful, and I can't wait to go back again. Located on Scranton Road in historic Tremont, The Tremont Tap House is a blend of industrial and contemporary. With its exposed brick, hardwood floors, and warm cherry wood accents, the place is warm and inviting with an artistic flare. The soon to be open patio looked like a great summer hot spot! Their Beer Cheese Soup left something to be desired. The flavor was a little bland, and the croutons were extremely hard. It also didn't help that the soup was less than hot, even though we were mere feet away from the kitchen. The Seared Sea Scallops with white truffle oil and wild mushroom risotto was another story. The scallops were cooked to perfection, with just a slight outer crisp. The risotto was a nice consistency, and was both tasty and eye-pleasing. Their real claim to fame is the beer list. With over 100 selections, 24 on tap, it's hard not to find one (or two or three) that you love. I recommend Bell's Oberon- think Great Lakes' Holy Moses or a Blue Moon. Perfect for summer. All in all, we definitely plan to go back! I had the pleasure of being invited to the 3rd Annual Fahrenheit Patron Party this past weekend. Rocco's talent was shining at this Mexican-inspired tasting. For $32, guests received six courses and two Patron-infused cocktails (what a deal!). This dish was a simple classic, but the chips were delicious and the guacamole was tart and salty-just how I like it! By far our favorite dish of the evening! This "dip" was filled with large hunks of real crab meat, the sweet corn just shined, and the pickled chilies gave it just the right amount of "zing". This should be on the regular menu at Fahrenheit! Tasty and rich in flavor! This was the weakest dish on the menu, but mainly because our plate did not include the fresh avocado. When the plate arrived, it looked bare. All of the chorizo was clumped together on one slice of the pizza, and the avocado was mysteriously missing. It was still a tasty dish, but fresh avocado and extra cilantro would have given this dish the extra push that it needed. Served off of Rocco's truck parked on the sidewalk, this course was one of the best. The battered walleye and shrimp were light and tasty, and the cabbage slaw was one of the best that I've had in a while. All of the components worked wonderfully together, and getting them off his "roach coach" was part of the fun! I went for the fried ice cream, but both desserts were fantastic. The ice cream was coated in sweet crushed corn flakes and drizzled with honey and chocolate sauce. The cheesecake reminded me of key lime pie- it was so light and refreshing. The flavor of mango was well thought out and not overpowering. A perfect finish to a wonderful tasting! All of the dishes included in the tasting really highlighted Chef Whalen's talent. It just goes to show that a true chef can create simple dishes that are packed with flavor and tickle the tastebuds.